Short Business Description: Bruno’s has something for everyone – we offer American cuisine for lunch and dinner all week long and brunch on the weekends. We provide both onsite and offsite catering and banquet space for special events. Bruno’s Bar and Grill is your “go-to” place for delicious food and local fun! From live music, to trivia night, to special events or watching the game with a fun crowd, we want you to come in and have a great time! Whether you are craving burgers, steaks, ribs or salads or just want to have some fun in Scotts Valley, we’ve got you covered! Upstairs in Bleachers Sports Bar we have a pool table, ping pong, foosball, shuffleboard, corn hole and darts for you to play. On the back deck we have 3 fire tables, 5 heaters and ample seating under cafe lights. We are working hard on revamping the restaurant and we will continue adding fun events for you to come enjoy. Family-owned brewery known for house-made British cask ales & American styles, plus packaged snacks. 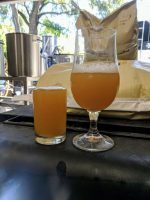 We are a small Brewery located in the Santa Cruz mountains focusing on barrel age, farmhouse, and IPA beers.